Milan, the most important fish market and centre of excellence as for fish consumption, has a new quality brand, presented by SO.GE.MI Joint-Stock Company and Confcommercio Milano. With this news, a certification concerning the entire supply chain, from harvesting (fishing and farming) to the table arrives. This brand will allow commercial operators - wholesalers, retailers in both fixed and public area, restaurateurs - to further enhance the products of the fish market in Milan, so meeting consumers’ expectations about the safety of a product which is increasingly consumed raw. 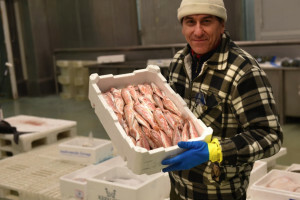 The operators who buy fish at the fish market in Milan will have the opportunity of asking SO.GE.MI the granting of use on the basis of safety requirements, guaranteed in their processing activities (cold chain, management of Haccp non-compliance, system and practices concerning waste treatment). Lino Stoppani, president of EPAM and FIPE Confcommercio, explained: ‘The brand can certainly be a valuable marketing tool, in order to immediately transfer the values ​​of both product and company to which it refers. In addition, through restaurants it will allow enhancing even more the fish market in Milan, the most important one in Italy in terms of quality, too’. Alex Vagnoli, President of the Association that gathers wholesalers and seafood agents, says: ‘Traceability of products is essential and the quality brand that will be applied by all operators on the products is a good and innovative idea. Many companies will join and therefore the brand will be an added value for the choice of the product’.